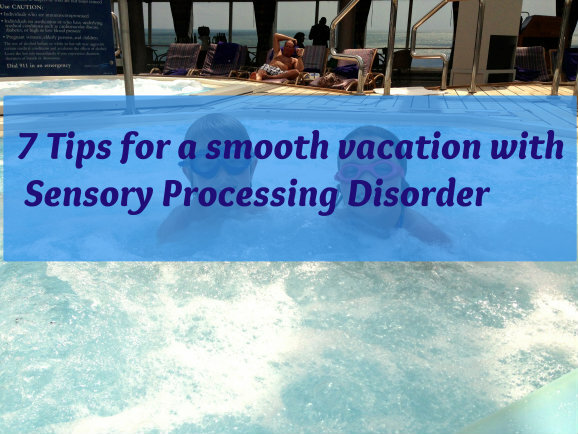 Life with a child who has Sensory Processing Disorder can be stressful, and taking a break to go on vacation is good for everyone. 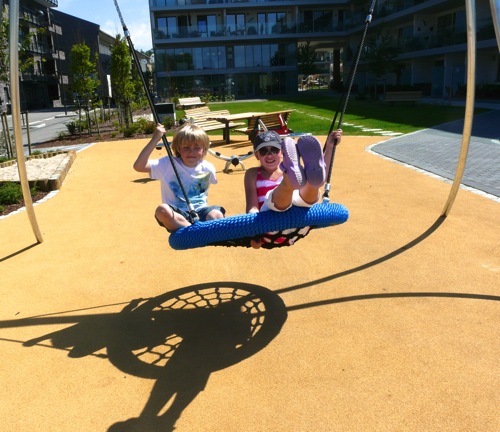 But being away from home brings its own challenges – both in terms of the SPD itself and how you as a parent cope with the “goldfish bowl” aspect of being away, especially if you’re visiting or travelling with friends or extended family. 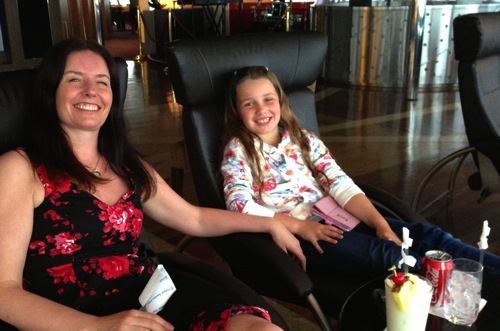 I recently spent a week sharing a small room on a cruise ship with my 9 year old daughter, 8 year old son (who has Sensory Processing Disorder) and my mother. We had a lovely week (and only the one trip to the ship’s doctor, when J(8) cut his head on a cushion-strewn stone bench). While we were away, I jotted down some ideas to remind myself how best to make sure future holidays go as smoothly. Before you leave home, discuss where you’re going and what it’s going to be like. Often we have it all planned in our heads but don’t think of sharing the details with our children. This is fine with most kids, but a child with Sensory Processing Disorder does best if he knows what’s happening. We homeschool, so I involved both my children in the planning stage for our Norway cruise. You may not want to go into as much detail as we did, but if you’re visiting more than one place, consider making a visual itinerary. If your child has any special dietary requirements, talk in advance about the kind of food that will be available while you’re away, and consider together how best to manage her dietary needs. My son does much better on a low sugar, gluten and dairy diet. At home we can accommodate this without him missing out on treats – we make cakes and cookies with gluten free flour and agave, for example. But even if it were possible to follow his diet strictly when we’re away, it would mean both him and his sister (not to mention me) missing out on one of the pleasures of being on vacation – delicious food. We handled this on the cruise by agreeing to be quite strict at the start of the holiday and to relax as the week went on. It’s easier to go from no dessert to sugar-free ice cream to “Okay, you can have chocolate flavour” and finally to “Yes, with chocolate sauce if you like,” than vice versa! The effects of the foods to which my son is sensitive are cumulative, so by gradually relaxing the usual rules in this way we can delay the worst of their effects until we’re safely home. Meanwhile, he comes away with happy memories of being able to enjoy vacation treats like other children. Whatever kind of vacation you take, there may be short periods when your child will be looked after by unfamiliar people. Adults who have no experience of SPD usually try to reason with a child who is mid-meltdown. This is well-meant, but useless (or worse). Someone who is emotionally flooded is not capable of reason – what they they need is a safe space to calm down. While they were in the club I provided my children with a two-way radio. Once, at the start of the week, C(9) called on it to let me know her brother was distressed and needed collecting. Other times J(8) was just able to call to say he’d had enough. Knowing he had control of his situation helped him relax and enjoy the fun and games. Parents of special needs children are used to dealing with uncomprehending (and at times judgemental) looks and comments from outsiders. I love Avant Parenting’s recent take on this in Coddling, indulging, nurturing, supporting. We each develop our own strategies for handling other people’s opinions. Mine is to tune into my heart, hold true to my parenting values, and not allow how I care for my son to be influenced by other people’s negative comments (no matter how well meant). At a time when my son needs extra support in an unusual environment, I’d rather err on the side of “pandering” to my child, than pandering to the peanut gallery. It’s not easy having a brother or sister with Sensory Processing Disorder and vacations can be extra difficult, with more parent time being taken over supporting the SPD child, plus the embarrassment factor of new people witnessing his odd behaviour and meltdowns. Whenever we’re away I try and find time to spend alone with C(9) without her brother. Even half an hour doing something fun together can go a long way towards making everyone’s vacation better. Take with you any sensory tools and equipment you can fit in, like hand fidgets, aromatherapy oils and headphones. My son used his chew tubes more during the week we were away than he does in a month at home. We’re about to invest in a fabric sensory tunnel to use at home, so in future we might take that too. At home, I try and make sure my son takes regular breaks from his DS/Minecraft/the Wii to jump on the trampoline or chill out quietly. When we’re away, I don’t worry about screen time. We do plenty of other activities as part of the holiday, so if he’s calmly relaxing with an iPad or DS the rest of the time, that’s okay. It’s my vacation too! One of the difficulties with writing about SPD is that it affects each child so differently. My son’s SPD affects primarily his vestibular and proprioceptive systems, plus he has some tactile and auditory issues, though these are not as bad as other cases I’ve read about. As parents of these wonderful, special children, we need all the support we can get. I hope that you find something helpful in what I’ve written. If you do, or if you have any tips to add, I’d love to hear from you. “We were just saying how beautifully behaved they were!” the woman said. I may not play to the peanut gallery, but given the timing, I’ll take that as a vote of confidence – a vacation with your SPD child is not a contradiction-in-terms! A really well written post, Lucinda! And with so many great tips too. My favourite is the 2-way radio. I think it’s absolutely crucial for children, especially those with SPD, to know that they have a “way out” of an impending meltdown scenario. Thank you so much, Hwee 🙂 I was very relieved the radios worked on the ship! Big thank you for this post from a mum of a boy with SPD. I is so reassuring and inspiring. I your especially liked your way of dealing with judgments/ uncomprehending – “…to tune into my heart, hold true to my parenting values”. I personally would like to learn more about how you cope and manage the condition. I absolutely love your blog by the way! From design to the content. As a busy home schooling mum I don’t get to read that many blogs, so yours is one of the very few I read regularly. All the very best to you and your beautiful family. Hi Lucinda, my son is going to be 5 in August. I have been homeschooling for the last 7 months. To deal with SPD we started iLS therapy combined with the special program (exercises) developed by our OT. I find gluten and dairy free diet is helping a lot (although it is a bit tricky to keep dairy free sometimes) and supplements. As you rightly said SPD affects each child so differently. But funny enough my son’s struggles are very similar to J’s: vestibular and proprioceptive systems are affected the most, hence problems with concentration and self regulation. I’ve been studying SPD for the last few months and it’s been just a couple of weeks ago that I felt that we’ve got it more or less under control now. It is not ideal, it is steel frustrating at times, but it seems everyone is having better quality of life now. Lucinda, you are most welcome to email me, I will be glad to answer your questions re iLS. Just like you I often feel the need to talk to somebody who has similar problems… sometimes just to see I am not alone! You probably know about SPD blogger network http://www.spdbloggernetwork.com/, that’s where I found lots of great ideas re sensory diet, equipment, movement breaks etc. Thanks, Elena, I appreciate that. Funnily enough I just found the SPD blogger network, as I was writing this post – I’m not sure how I missed it before. I’m looking forward to having a proper look. People’s first hand experiences are so valuable, aren’t they? Great ideas! We’re going on a trip in August which includes a long drive, a long plane ride and 7 days on a cruise ship (with 4 stops for land excursions). I’ll be bringing a long a “survival backpack for my son with SPD: headphones and music, plenty of snacks and water, gum, a box of Legos, my Kindle Fire, and a thin blanket (as if things are too much he likes to listen to music and cover his head with a blanket). I’ll also have a list of what we’re doing…and maps for the kids to follow. He’s much better at handling the “world” now at 8 then he was at 4, before OT and LT. It should be a GREAT trip! It was lovely to have met you at the LTTL conference over the weekend! Great blog and I love all the activities that you do with your kids. Great encouragement here and just a great reminder and application for everyday situations too when helping our beautiful children. My 8 yr old son is so similar and this is just so helpful! Thank you. Thank you so much for your post! My son who is 2 has SPD and struggles with Dyspraxia. We have a Disney Cruise coming up in a few weeks and am getting a little nervous! This was so helpful! Jessica – thank you so much for your kind comment. I wish I’d known my son had SPD when he was 2. Have a wonderful time on your cruise. I’d love it if you would come back and share any other tips you have afterwards!